World number one Novak Djokovic returned to winning ways with a straight-set victory over Australian Bernard Tomic to reach the Miami Open third round. Serbia's Djokovic, who lost in the third round at Indian Wells last week, beat Tomic 7-6 (7-2) 6-2. The 31-year-old is aiming for a record seventh title in Miami and faces Argentina's Federico Delbonis next. Britain's Dan Evans plays Canadian Denis Shapovalov later on Saturday. 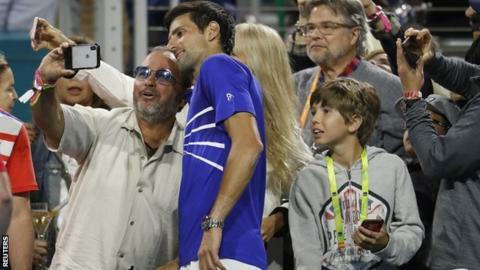 "I've had quite a lot of court time between [my] Indian Wells loss in singles and now tonight's match," said 15-time Grand Slam champion Djokovic. "I've worked on everything I need to work on. Now it's just a matter of time to build the momentum and build that match play." Elsewhere, Austria's Dominic Thiem, who beat Roger Federer to win Indian Wells on Sunday, missed out on the 'Sunshine Slam', losing 6-4 6-4 to Hubert Hurkacz of Poland.